Last year I read a piece in Southern Living magazine that had me laughing out loud. “Taking Sides” by Allison Glock described a formidable family tradition in the form of The Cranberry Salad, a side dish that nobody liked but was made and served each Thanksgiving day as a matter of family tradition. I could relate. I was already acquainted with The Cranberry Salad tradition, though in my family the salad was made with an eggnog layer and was served at Christmas dinner rather than Thanksgiving. Ours had not yet spawned any of its own “baby traditions” but Aunt Hen's Cranberry Eggnog Salad was a signature recipe. Festive and interesting, it was associated with Aunt Hen's table. Not only was it known as her recipe in our small community, Aunt Hen submitted the recipe to Southern Living magazine where it was published in the November 1986 issue. While this detail added a certain gravitas to Aunt Hen’s recipe among her contemporaries, it did nothing to make it any more palatable from my point of view. I never liked bits of anything, sweet or savory, embedded in my jell-o. What’s more, well past childhood I had serious doubts about eating cranberries or nuts and eggnog is something I have never cared for. While tasting Aunt Hen’s Cranberry Eggnog Salad didn't appeal to my young palate, I admired it's composition all the same. The salad added a touch of drama to Aunt Hen's holiday table and the bright contrasting red and white layers were undeniably pretty. From time to time I would ask her to tell me about the salad, what was in it and why she made it but, as far as I can remember, I never actually tried it. Though my dad would say, “you just don’t know what’s good!" with a mischievous grin as he took another bite himself, Aunt Hen knew my preferences and never held it against me. Aunt Hen was always the hostess of my family’s Christmas Dinner. On Christmas morning, after waking early and opening gifts at home, we would run to Aunt Hen’s house, just two doors away, past the old tin-roofed farm house where my father grew up, to see what Santa might have left for us there. Because he knew our family like he did, the jolly old fellow was kind enough to fill stockings for us there just as he did at our own house, while he tucked a few more gifts with our names on them under her tree. Aunt Hen would already be up and in the kitchen no matter how early we arrived. She usually had a ham in the oven and was working on a variety of side dishes by the time we got there. After greetings we gathered around her Christmas tree to open gifts. That done the adults would reconvene in the kitchen to finish dinner preparations. Daddy sliced the ham while Aunt Hen and Aunt Betty put the finishing touches on the rest of the meal: scalloped potatoes, an oyster casserole, Southern Style Green Beans and, of course, the Cranberry Eggnog Salad. While there may have been older family traditions that inspired Aunt Hen to serve a ham or an oyster casserole, the cranberry eggnog salad was her own personal contribution to our menu of holiday traditions. 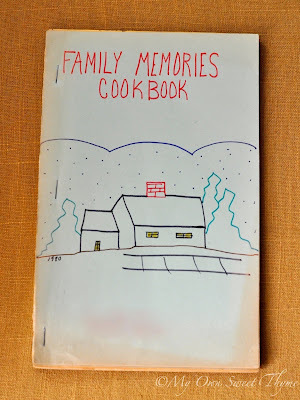 In a homespun church cookbook from 1980, a version of Aunt Hen’s Egg Nog Salad is given a page. The forward to the recipes collected declares, “This booklet is about remembrances of good times and good food…” Several other pages include sparsely detailed recipes accompanied by charming memories of holidays past and paragraphs about the traditions of families in our community. Aunt Hen’s page, on the other hand, details the recipe with clarity and precision while her words about the significance of the recipe state simply, “There is no special memory or tradition about this recipe. It is just one I always use at Christmas.” Reading that, I have to smile. In it’s own way, that page portrays a perfect likeness of my aunt. As I grew older I became more and more interested in our old family recipes. When I made my Family Heirloom Cookbook I included the recipe for Aunt Hen's Cranberry Eggnog Salad among other favorites like Brownie Pie, Peanut Butter Fudge, and Cherry Cheese Pie in Aunt Hen’s section of the book. I still hadn't tried the recipe myself. I added it on her authority, as well as that of Southern Living. After all, everyone knows you can trust a recipe published in Southern Living. Finally, one Christmas season, the stars aligned. I found my jell-o mold, a thing I had never used but had set aside years earlier for this very purpose, and I remembered the recipe. Over the years my tastes had evolved and I even considered it within the realm of possibility that I could enjoy a salad of eggnog and cranberries. What's more, I had a number of the necessary ingredients on hand. I had a carton of eggnog in the refrigerator and some chunky cranberry sauce left over from a test recipe. I had gelatin and crushed pineapple in the pantry. At last it was time to try Aunt Hen’s special recipe. It was a busy Saturday during the holiday season. Distracted by the events of the day I missed the target consistency of the cranberry layer. It was mostly set by the time I finished the eggnog mixture. Undeterred I poured the eggnog layer on top and let it set without much worry. When it was ready to be released from the mold all seemed well. I took a few photos then let it rest in the refrigerator until dinner time. Grace was said and plates were filled. Still no one had touched the Cranberry Eggnog Salad. I urged them on but met with resistance. Finally I took it upon myself to dig in. I gently pressed the serving spoon against the salad to cut a slice. 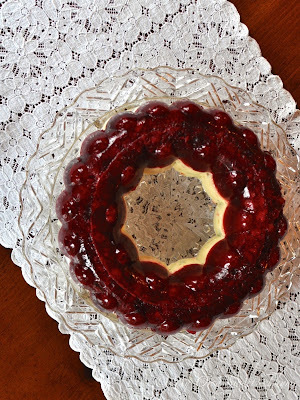 Just as I thought it was about to yield the entire wreath shaped upper cranberry layer slid away from the eggnog layer beneath it and onto the white linen tablecloth! Surprised and slightly horrified I heard a collective gasp. A moment later everyone at the table burst into laughter. Vindicated in their resistance my children helped me gather the cranberry layer back onto the eggnog salad. They even tasted the ravaged remains briefly before getting back to the Southern Style Green Beans, Cornflake Casserole and Pumpkin Bread of their own cherished holiday traditions. Taking a bite for myself I had to admit I still found the tastes of the salad unappealing. Maybe it was the type of cranberry relish I chose to use. Perhaps it was the problem with the setting consistency of the eggnog layer. Or maybe it was that I just don’t like eggnog or textured bits of anything in my jell-o. I know I didn't like the celery in the eggnog layer. Whatever the reason this is one family tradition I will probably leave in retirement, at least until I can think of a good way to make it more palatable to current family tastes. Still I’m glad that I gave it a try. And who knows? Just because I didn't like it doesn't mean that you won't. After all, I don't even like mayonnaise! In a mixing bowl, pour boiling water over gelatin; stir until dissolved. Add cranberry-orange relish, stirring until thawed (if frozen) and well combined. Pour mixture into a lightly oiled (or spray with cooking spray) 8-12 cup mold. Chill until partially set. Drain pineapple, reserving the liquid. Set pineapple aside. Soften unflavored gelatin in pineapple juice, and let stand 5 minutes. Cook gelatin mixture over low heat until the gelatin dissolves; add lime juice and eggnog. Chill until partially set (until the eggnog mixture is roughly the consistency of unbeaten egg white.) Fold in pineapple and celery (if desired). Pour over cranberry layer. Chill until thoroughly set. Unmold onto lettuce leaves (if desired). Yield: 14 servings. This holiday season I am, once again, learning my way around a new kitchen. This one is a little farther east than the last one, and a little farther south. The windows over the countertop invite the morning sunlight as they look out across my front porch on to a pretty little park filled with large pecan and small oak trees. The kitchen is efficient and well appointed. There are nice stretches of counter space to work on, one facing the park and another facing the family room. A large professional style gas range with iron skillets resting on the back burner challenges me and warms the décor. Still I am a cautious creature. It is hard for me to just dive in. Things are, again, different here and take some getting used to, especially during the holidays. Maybe that’s why I am so enjoying the scents of the season this year. Ginger, nutmeg, cloves and cinnamon are familiar scents that suggest fond memories and bring a sense of the familiar into present circumstances. Here, my basic recipe for Sunday Special Coffee Cake is at work again. This time I have adapted an adaptation I settled on when I made a Pecan Graham Coffee Cake several years ago. Instead of using the graham crackers I substituted crushed ginger cookies (you can use homemade or store bought) to add texture to the streusel crumbs. I also added a robust blend of holiday spices and a touch of molasses to the batter. This cake turns out dark and fragrant with a sweet layer of crunchy streusel glazing the top. Warm from the oven it makes a nice addition to a weekend or holiday breakfast. It tastes great with a warm cup of coffee or spiced apple cider. A little later in the day, if there is any left over, it can do a repeat performance as a snack or a simple dessert. Place ginger cookies in a quart sized Ziploc freezer bag. Squeeze out the air and seal the top. Crush gingersnaps using a rolling pin. In a small bowl, combine ¾ cup of the crushed cookie crumbs, sugar, flour, ginger, cinnamon and cloves. Add the butter in several slices and mix to a crumbly streusel with your fingertips or with a fork, if you prefer. Stir in the toasted pecan bits and the remaining ¼ cup cookie crumbs. Set aside. In a small bowl, combine the flour and next six ingredients using a wire whisk. In a medium bowl, whisk the eggs until frothy. Add the brown sugar, molasses and melted butter blending until smooth. Add the milk, whisking until well combined. Pour batter into a prepared 9-inch baking pan. Scatter the streusel topping crumbs on top of the batter. Bake in a preheated oven at 375 degree for 25-30 minutes, or until the cake tests done. Last week I found stalks of Brussels sprouts for sale in the produce section of Sprouts market. A generous quantity of individual sprouts adorned each stout central stalk budding out from the base where each leaf had grown. It caught me by surprise. I don’t often see Brussels sprouts for sale like that so I put a stalk in my cart based on the novelty alone. Farther down the aisle I saw bags of fresh cranberries. Not yet sure how I might use them I remembered years when they were hard to find. They make a great garnish or decoration, if nothing else, and can always be frozen for later use so I put a bag of those in my cart as well. While I wondered how I might use my impulse purchases I gathered a few more items and pushed my cart to the front of the store. In the process I forgot the orange juice, one of the main reasons I had come to the market in the first place. That’s just how my shopping rolls sometimes. Unloading my groceries I was impressed by how festive my produce looked. The deep red of the cranberries sparkled beside the fresh green of the Brussels sprouts. Both were pretty in their own way and together they looked like Christmas. But both can be tricky too. The flavor of Brussels sprouts quickly develops from bright crisp-tender freshness to mushy gray bitterness if even slightly overcooked. And cranberries, if undercooked, have a pithy texture, are sharply tart and lean toward bitterness too. In the end I put them both in one dish, letting them balance each other in combination. I have learned that roasting Brussels sprouts can bring out the finer qualities of this nutrition-packed vegetable, so I cut each sprout in half and roasted them cut side down on a baking sheet. Halfway through roasting, once the cut edges began to brown, I added the cranberries along with a little maple syrup to soften the tartness and a splash of balsamic vinegar to mellow any bitterness. I also scattered a handful of pecans on top to round out the flavors and add a hint of crunch. The result was flavorful and elegant, perfect for Christmas dinner but easy enough to serve at any meal. Spread Brussels sprouts on a rimmed baking pan, cut side down. Place baking pan in the center of the oven and roast for 10-15 minutes (depending on size of the Brussels sprouts). Meanwhile, whisk together the maple syrup and balsamic vinegar. Stir in the fresh cranberries until coated. After 10-15 minutes, when the cut surfaces of the sprouts just begin to brown, remove the Brussels sprouts from the oven. Pour the cranberry mixture over top, stirring the Brussels sprouts and cranberries together. Sprinkle the pecan pieces over all. Return the pan to the oven and continue roasting 10-15 minutes, until sprouts are fork tender and cranberries have softened. I think my favorite flavor of the holiday season is ginger. Christmas wouldn’t taste or smell like Christmas without spicy notes of ginger and cinnamon wafting through the house and lingering in the kitchen. A pinch of ginger is the perfect way to dress up favorite family recipes, both sweet and savory, for the holidays. The scent of ginger transports me, reminding me of Christmases past while promising something delicious in the present tense. Ginger introduces a subtle tension: warm spice nestled against cool freshness, bitter balanced by sweet. Ginger is what anticipation should taste like, the touchstone of the season. With a nod to seasonal anticipation I adapted the recipe for a family favorite, Buttermilk Scones, by adding a ginger-heavy blend of aromatic spices and a sweet touch of molasses. The recipe is a good one. The execution, however, was slightly, well, wanting. As often happens all did not go exactly as expected. As you can see in some of the photos my fragrant Gingerbread Scones turned out a little dark (read black) on the bottom. That’s how it goes sometimes. You can let it get you down or you can accept it and move forward. This batch didn’t turn out as picture perfect as I may have liked but that doesn’t mean they weren’t beautiful in their own right and it doesn’t mean they weren’t delicious. These fragrant scones are something to look forward to on a cold winter morning or as a teatime or after dinner treat. Next time I will just remember not to bake them on a dark pan and to check them a few minutes earlier. Preheat oven to 425 degrees. Grease baking sheet. Mix flour, brown sugar, ginger, cinnamon, cloves, baking soda and salt, in a large bowl. Cut in butter until the mixture resembles course meal. Stir in the buttermilk, molasses and most of the egg (reserving just a little to brush onto the top of the scones). Turn dough out onto a floured surface and knead until smooth. Dough will be moist. Pat dough out into a circle 1½ inches thick. Transfer to a prepared baking sheet. Cut into wedges. Brush top with reserved egg; sprinkle with coarse sugar, if desired. Serve immediately with butter or whipped cream and a steaming cup of coffee or Earl Grey tea.